Looking for the perfect way to treat mom this Mother’s Day? We’ve rounded up the best brunch offerings in Tampa Bay for Mother’s Day 2018! 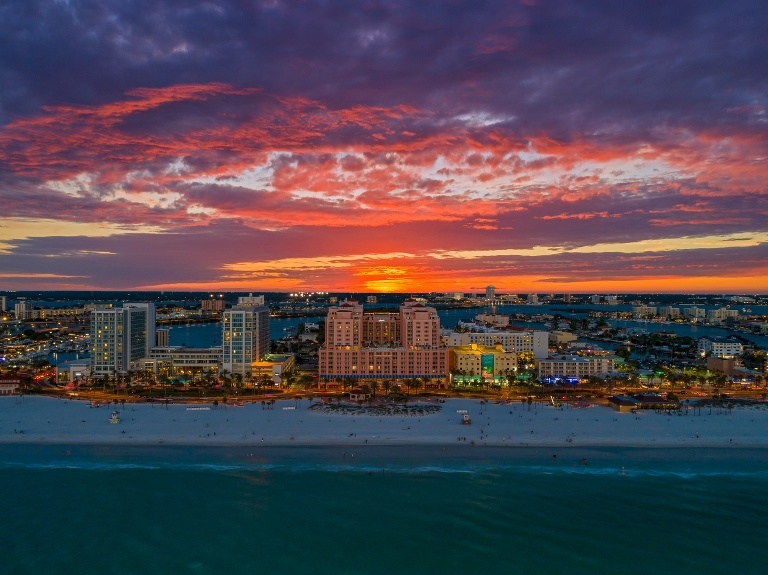 Enjoy a delicious brunch buffet with unlimited mimosas and Bloody Mary bar while taking in the breathtaking views overlooking America’s #1 beach, Sunday, May 13th at SHOR American Seafood Grill located in the Hyatt Regency Clearwater Beach! View the brunch menu, which include Southern Style Benedict, Key Lime French Toast, Roasted Beef and Lamb carving stations, and delicious Seared Scallop small plates prepared to order. Adults are $68, Child $28 (5-12 years old), Children under 4 years old are free. Treat mom to a spectacular Mother’s Day cruise aboard the Yacht StarShip. The entire family will enjoy a lavish brunch or dinner buffet prepared by the Yacht’s Executive Chef, while experiencing the best views of Tampa Bay! View the online menu, with highlights including Potato Pancakes with Apple Compote, Dijon Marinated Flank Steak, and Seared Rare Tuna Nicoise Platter! Adult Brunch Buffet is $59.95 (plus taxes and fees), Child Brunch Buffet: $39.95. 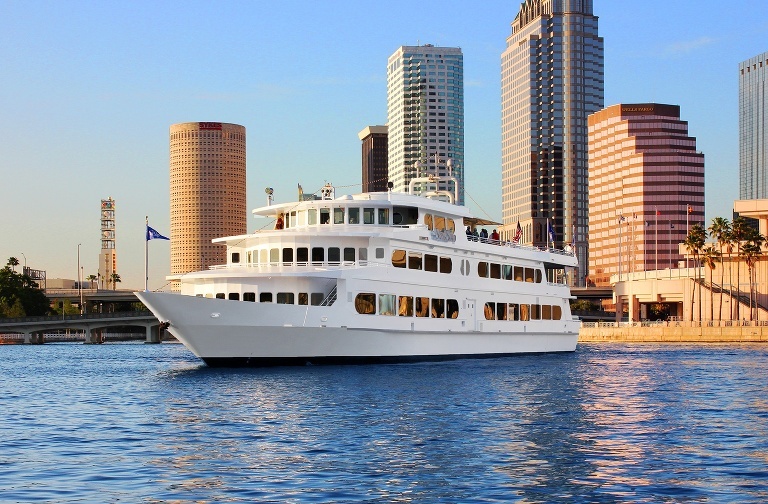 Mother’s Day Brunch and Dinner Cruises depart from Tampa and Clearwater. 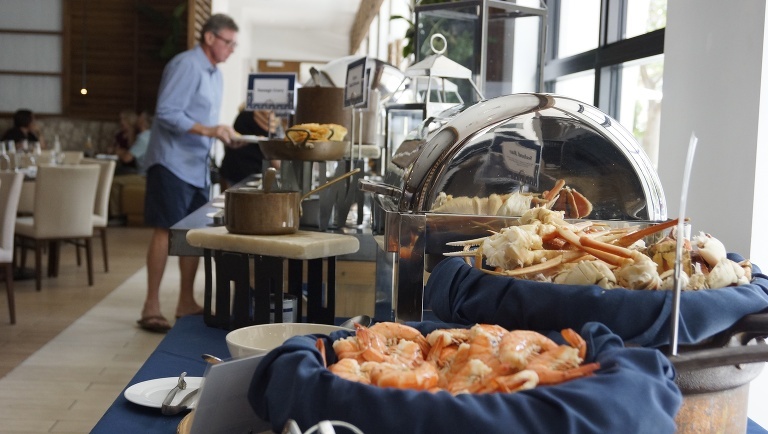 Mom eats free with another adult brunch purchase during Ocean Hai’s elevated Brunch Buffet at the new Wyndham Grand Clearwater Beach. Enjoy bottomless mimosas, fresh baked muffins, doughnuts and breads, a delicious seafood spread, an omelet and hot station, decadent carving station and much more. Make sure you save room for dessert! Indulge in an assortment of cakes and mini desserts. Mom eats free with another adult brunch purchase, Adults $64, Children 6 – 11 years old $24, and Children 5 and under are complimentary. Louies Modern is celebrating women in downtown Sarasota on Sunday, May 13th with a bountiful brunch buffet with extra special treats for Moms! Those who dine with at Louies Modern on Mother’s Day receive a special Father’s Day offer and Moms will receive a surprise gift! View the full menu online, highlights include brunch favorites, raw bar, sweets + bagels, multiple carving stations, salads, and more! Brunch is $65 for adults and $25 for kids 5-12. Call 941-552-9688 to make your reservations! Celebrate Mother’s Day at The Birchwood from 10 a.m. – 4 p.m. with their famous Mother’s Day Brunch Buffet in the Grand Ballroom or with a limited menu at Birch and Vine. The Mother’s Day Grand Buffet is served in The Grand Ballroom on the 4th floor of The Birchwood, overlooking Vinoy Park and the Marina. 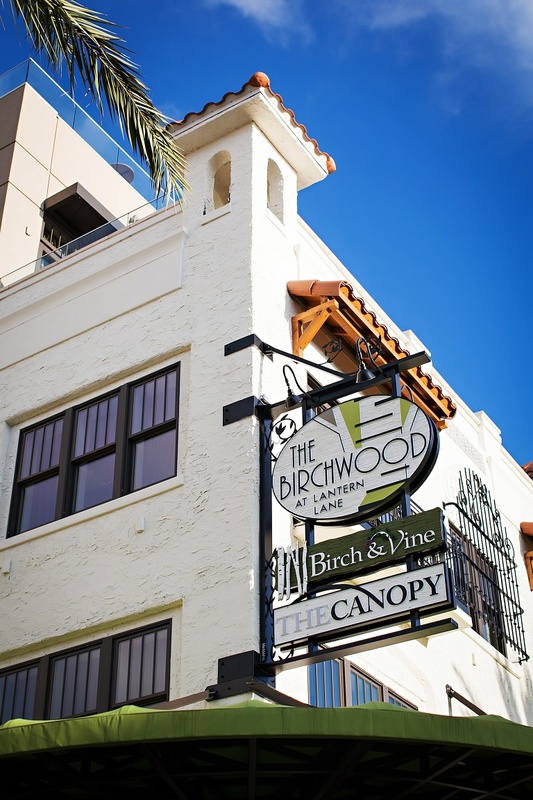 Mother’s Day Brunch at Birch and Vine combines fine dining with St. Petersburg’s laid-back lifestyle and creates an alluring dining experience for all. Sidewalk café and terrace seating available. View the full menu for The Grand Ballroom Brunch, boasting over 50 different items. Selections range from a classic egg and omelet station to a Fruit de la Mur station including oysters, shrimp, crab, and more. View the full Birch and Vine A La Carte Menu, featuring dishes such as our famous Blueberry Compote Pancake Stack and our decadent Chicken & Waffle Open Faced Sandwich. The Grand Buffet is priced at $55 per person. Birch and Vine’s menu is a la carte. Bringing Mom to the legendary Pink Palace is a great way to show your love! The Don CeSar is known for their famous brunches, and the King Charles Brunch is always top notch and only offered on special occasions. Enjoy unlimited champagne with mom! View the full menu online. Highlights include a fresh fruit and breakfast bar, omelettes made to order, Citrus Panko Crusted Mutton Snapper entree, and dipped cheesecake lollypops for dessert! Brunch for adults is $85 (plus taxes and fees), children $26, and includes self-parking. Enjoy waterfront dining with Mom and a delicious all-you-can-eat-buffet and an all-you-can-drink mimosa and Bloody Marys at the rustic island style indoor/outdoor dining at the Godfrey Hotel & Cabanas in Tampa! 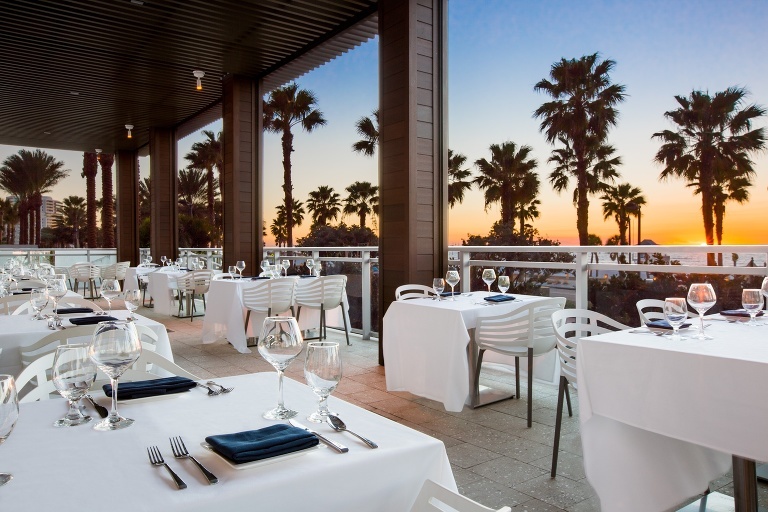 Menu highlights include Pistachio Crusted French Toast, Herb Crusted Snapper, Broccolini, Marscapone Polenta, Carved Rack of Lamb, with Tarragon Demi, Raw Bar and Desserts! Brunch is $40 per person, and only $10 more to enjoy unlimited mimosas or Bloody Marys! Atop the Urban Centre Towers in the heart of the Westshore District, the Centre Club features panoramic views of Tampa Bay. 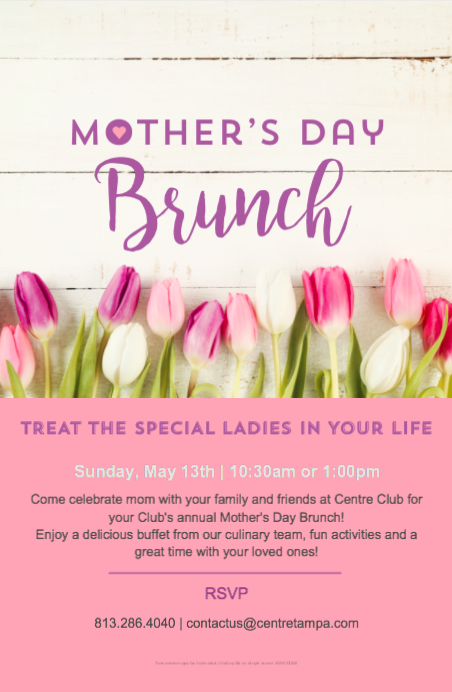 Their annual Mother’s Day brunch buffet includes an omelet station with sweet potato hash, bacon, sausage, lox, snow crab, oysters, jumbo shrimp, a beef tenderloin and turkey carving station cake and ice cream bar. Bloody Marys and mimosas are only $5 or you can pre-order bottles of champagne and receive 20% off. View the full menu online. Adults tickets are $35, children $15 (ages 5 – 12), plus tax and service charge. Children 4 and under are complimentary.